Running a small business with any kind of Web presence involves tracking information from multiple online services such as Google Analytics, Facebook, and MailChimp. The new website Cyfe populates a dashboard with widgets for commonly used Web services, gathering your important data in one place. Cyfe launched in testing mode this week. It uses multiple configurable windows, or widgets, to represent data from different sources. The overall feel is like iGoogle for businesses. This dashboard easily houses six widgets without making you scroll around. Cyfe provides a free plan that includes five widgets, and three paid plans starting at $9 per month for 20 widgets, up to $49 per month for 100 widgets. Each plan allows an unlimited number of scrollable dashboards to place the widgets on. Widgets for all plans update every 10 seconds, keeping all data current. Especially useful for some will be the caability to not only add custom branding to a dashboard, but also to be able to share it with others, a way to keep other departments or customers up-to-date on important stats. Out of the gate, Cyfe offers an impressive collection of widgets, which can include data from: Salesforce, Google AdSense, Freshbooks, MailChimp, Facebook, WordPress, Amazon Web Services, YouTube, Zendesk, Google Analytics, SendGrid, FeedBurner, AddThis, GoToWebinar, Alexa, Constant Contact, Twitter, Gmail, Pingdom, SEOmoz, and Google Webmaster Central. It can display any RSS feed as well as custom widgets, which accept input from a local or Web-based CSV file and can display it as a line, area, column or pie chart. The Cyfe website notes that more services are coming soon. Charts provide detailed information when you mouse over them. I tried Cyfe and found it easy to use, with a free setup process that only requires a name, email address, and password. After clicking a link in a confirmation email, you can begin immediately adding widgets to your first dashboard, which starts with three demo widgets you can remove. Each widget has different configuration options, but most start with the option to add an account, which will authenticate to the service from which it will obtain data. Cyfe uses AES encryption to store login information, but wherever possible it uses OAuth to authenticate to services, so storing credentials isn’t necessary. Though Cyfe starts with an impressive number of available services and the widgets themselves are eye-pleasing and easy to use, they offer almost no personalization. For instance, if you’d like to see a list of the top five pages on your company website, which is available from Google Analytics, the widget can’t be configured to do that. 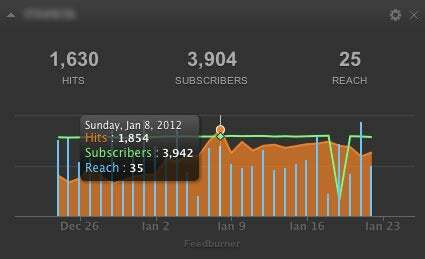 Instead, it simply shows the number of pageviews, visits, and visitors. Still, for a product in alpha/beta testing, Cyfe makes it easy to gather some of the important information businesses want to know within one sharable screen, saving you from having to log on to dozens of sites individually.